Accepting the awards are Lt. Leo Girard (left); Officer Vincent Price; Officer Tom Smith; Director Everette Robbins. Photos courtesy of Huron Township Department of Public Safety. 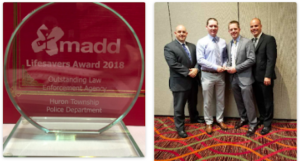 According to the Huron Hub, On Thursday, June 8, the Huron Township Police Department was recognized as the 2018 Outstanding Law Enforcement Agency by the Mothers Against Drunk Driving association (MADD). The Huron Township Police Department has been the recipient of many thanks for their stellar service. Read More at the Huron Hub. Huron Township is located in the southwest part of Wayne County. Named after the scenic Huron River which flows diagonally through it and the Indian tribe which once inhabited the area, the township today is still largely in agricultural use. Huron Township is home to the Local Development Finance Authority and businesses benefit from quick response to emergencies at their companies. Companies that are located in LDFA boundries have access to low interest rates for fixed asset purchasing and capital financing. Class A Sewer and Water, Surface roads already placed in some parts of the LDFA. You can follow the Huron Township Police Department on Facebook. Next:Michigan businesses who thrive on logistics are looking for truck drivers.